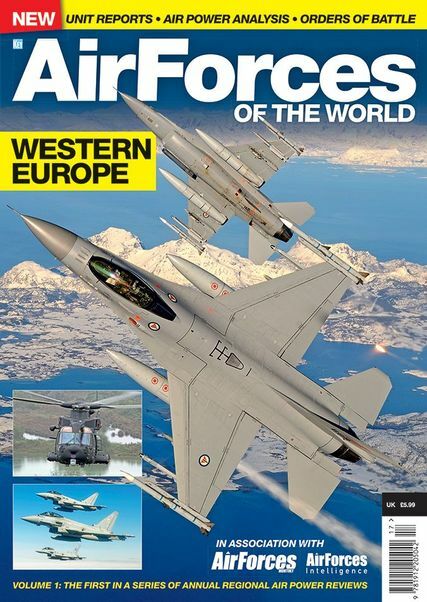 The first edition of AirForces of the World, a new series of air power reviews from the makers of AirForces Monthly and AirForces Intelligence, brings coverage of Western Europe. From the largest to the smallest, the region’s air forces are detailed in full in this 100-page special publication, with extensive orders of battle for every flying unit. Our correspondents also profile a select group of air forces and missions, with profiles of individual aircraft types and units. Senior figures from UK defence offer their perspectives on Royal Air Force equipment plans and recent operations. After decades of almost continuous participation in real-world missions, the Royal Netherlands Air Force F-16 squadrons are focusing on getting back into shape. The Swedish Air Force’s most northerly based fighter wing is dealing with new and resurgent threats and employing Cold War tactics in a fresh guise. The presence of NATO fighters in the Baltic is the most prominent – and enduring – manifestation of the alliance’s air policing missions. The Italian Air Force’s 15° Stormo is responsible for search and rescue and combat search and rescue missions, making it one of Europe’s few specialists in this exacting field of work. Tuote on lisätty luetteloomme torstaina, 21. syyskuuta, 2017.